To mark the introduction of this engine, Opel produced a special edition Manta and Ascona based on the SRB, known as the Silver 2. Both cars were available in metallic silver paint (hence the name!) but came with a few extras, including a factory fitted sunroof and the new 6Jx13 ATS alloy 5 spoke wheels, as part of the Silver 2 package. The interior was blue velour. Today few of the early B series Mantas remain. Even fewer survive in original or standard condition, during the 80's a lot had the later cars spoilers and interior added. There are probably less than 70 in the club, out of 900+ members. How many early B's do you see on the road or at local meets? 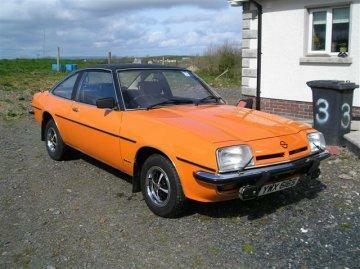 Prices seems to vary between £1000 for a reasonable example to between £2,500 and £5,000 for a concours one.